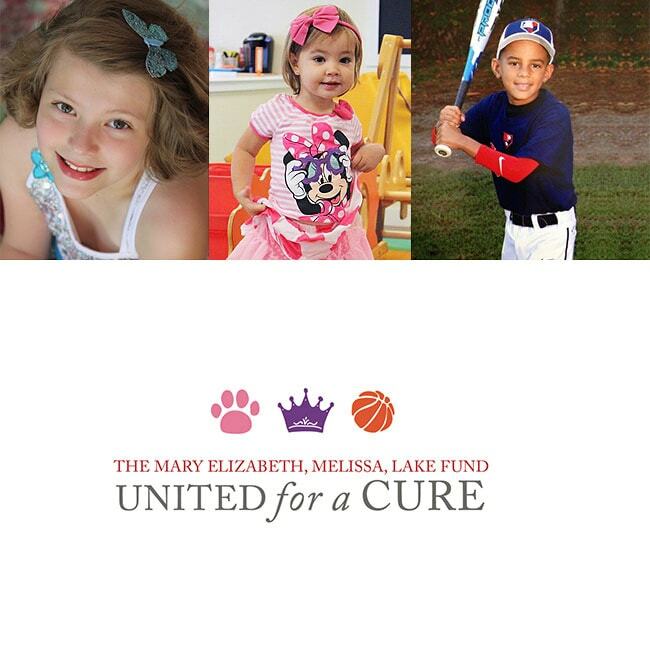 United for a CURE was founded in honor of three incredibly brave children: Mary Elizabeth, Melissa and Lake. While to an outsider these children may have seemed unlikely friends, to those who knew them, their connection was crystal clear. You see, Mary Elizabeth, Melissa and Lake not only shared a fiery spirit, but they also shared a battle against a monster of a disease: Acute Myeloid Leukemia (AML). Three children. One diagnosis. One treatment protocol. Mary Elizabeth, Melissa and Lake bonded instantly in the hospital and brought together three families for a united circle of support. If determination and prayers were enough, these three precious children would still be with us today. But AML is a monster, and it took the lives of Mary Elizabeth, Melissa and Lake within months of one another in 2015. Despite the tragic loss, three times over, their stories inspired hundreds of thousands and forever ignited a fire within three families – three families United for a CURE. No one saw it coming. Mary Elizabeth was a vibrant, happy 11-year-old in the spring of 2014 when the headaches, tummy aches and bruising started. Spring Break vacation was cut short when Mary Elizabeth visibly just wasn’t herself. She was soon diagnosed with AML – an aggressive leukemia requiring not just chemotherapy, but a bone marrow transplant. Despite Mary Elizabeth’s tortuous journey – including three bone marrow transplants from her brother, father and mother – Mary Elizabeth’s personality and love of life was simply infectious. Hundreds of thousands followed Mary Elizabeth’s fight, cheering her on and praying vigorously for her cure. She suffered through chemo burns over 90% of her body. Cranial radiation, near paralysis, induced coma, three lung bleeds – and indescribable pain. Mary Elizabeth minimized the suffering, complaining only of missing her cats and her brother and sister, who held such a precious place in her heart. Her family and friends – and thousands of strangers – prayed for a miracle. Mary Elizabeth died on September 2, 2015. And while her life was cut short, she left us with the miracle of having created an astounding level of awareness about the reality of an awful disease – childhood cancer. And she left us a challenge: to end the disease that cuts short such valorous, promising lives as Mary Elizabeth’s. It seemed Melissa was born to confer on the rest of us her infinite love of life. Adoring butterflies and princesses; singing and dancing her days away. Melissa’s parents always knew she was special and going to do big things with her life. They just didn’t know in what way. Melissa offered more inspiration in her three short years on this earth than most do in their lifetime. Her diagnosis of AML when she was only two years old was heart-stopping. Melissa’s parents braced for the onslaught of chemotherapy on such a young body. Melissa defied it, riding through the hallways on her bike after doses and doses of chemo. Unfortunately, Melissa relapsed after a bone marrow transplant. Melissa’s parents searched the world for life saving treatment options. But there were none. Melissa never stopped dancing and smiling through it all, always amazing her doctors and nurses with her strong mind and beautiful spirit. Her parents believe their little girl’s brief life is a giant lesson on how we all should love the life we have been given. To the utmost. Lake was all boy; he was non-stop motion. A basketball, his closest companion. Lake had a way of lifting people’s spirits just by being there. So his diagnosis of AML hit Lake’s family like a meteor. But chemotherapy, remission and a new baby sister cured everything. For a while. However, the cancer returned with a vengeance and Lake needed a bone marrow transplant. But this was Lake! Give him the ball and he was back to his old self. After the transplant, Lake was back in remission – back to being the Rock Star he was. But the cancer returned again. This time, with the heartbreaking news it was incurable. Lake’s parents decided their son should live his remaining months to the fullest. School, sports and the beach. Lake left us in May of 2015. Fittingly, he left with the Rock Star image that remains with the lives he lifted. The primary purpose of United for a CURE, The Mary Elizabeth, Melissa, Lake Fund, is to fund clinical research relating to Acute Myeloid Leukemia (AML) or research reasonably expected to provide significant and direct benefits to children diagnosed with AML.